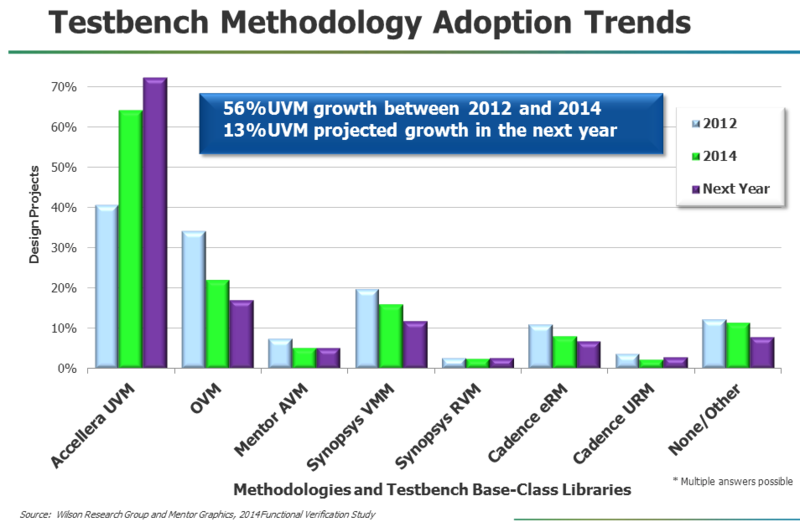 Semiconductor Engineering - What’s Next For UVM? Semiconductor Engineering - What’s Next For UVM? Home > System-Level Design > What’s Next For UVM? The ‘U’ in UVM was meant to be for ‘Universal’ but the notion of universality needs to be updated if it is to stay relevant. The infrastructure for much of the chip verification being done today is looking dated and limited in scope. Design has migrated to new methodologies, standards and tools that are being introduced to deal with heterogeneous integration, more customization, and increased complexity. Verification methodologies started appearing soon after the release of SystemVerilog. Initially they were intended to steer their customers into the subset of the language that they supported. In order to entice them to do that, class libraries provided some pre-built pieces of the testbench. Over time, the class libraries became larger and more complete, and at the same time, vendors managed to support all of the SystemVerilog language. That meant that the industry was left with a multitude of class libraries and associated methodologies – URM, RVM, VMM, AVM, eRM, OVM and lastly, the amalgamations of all of them UVM – the Universal Verification Methodology. But UVM is far from universal. First, all of the methodologies were conceived when all verification was performed using a simulator. While Emulation was beginning to make inroads, it was only seen as being a faster simulator with limitations. All of the other verification engines now in common usage were seen as fringe verification tools, including Formal Verification. In addition, systems have changed significantly over the past decade. These verification methodologies were designed to verify a block that was expected to be bolted onto a processor sub-system. It was not intended to be a verification tool for the processor sub-system, only for the additional logic. Today, the processor is so entwined with the sub-system, and a system is composed of a multitude of such sub-systems, such that UVM is not equipped to handle the verification task for an entire SoC. At the other end of the spectrum, mixed-signal design is becoming more prevalent, and the analog portion of the system has been held back using the old languages based on VHDL and Verilog. Only now are they beginning to seriously look at SystemVerilog, and with that comes the problem that none of the verification methodologies had given serious thought about how to verify the analog portions. It may be time to rethink UVM and that is becoming an active discussion within the community. At the Design Automation Conference this year, Accellera, the standards body that has been the driving force behind SystemVerilog and UVM, held a breakfast panel that asked the question about where UVM would be in five years. Those ideas and user interactions are included here along with thoughts from other industry leaders. Brophy points out that UVM has seen the fastest adoption rate of any EDA standard, and took only about five years to reach significant market penetration. Harry Foster, chief verification scientist at Mentor, who manages the Wilson verification studies, says that puts UVM at about 75% adoption, although the trend appears to be a flattening. While verification technologies have been seen as advancing faster than design, verification is still struggling to keep up. “There are some limitations as we start looking across platforms and writing stimulus for post-silicon, emulation, FPGA prototyping, virtual platforms as well as simulation,” says Faris Khundakjie, senior technical lead at Intel and chair of the Accellera Portable Stimulus Working Group (PSWG). “That is where we start to see challenges. Admittedly, UVM was created before these platforms existed and UVM is centered round simulation. As part of the IEEE standardization, compatibility with other standards is also being considered. “We also came in line with existing IEEE standards and looked at IP-XACT, TLM and existing standards to see how we could better align with those efforts,” says Alsop. The principal reaction of the panelists is that users can either talk to their vendors, who will represent them in the discussion, or they could make modifications to the open source implementation, which could be fed back for consideration. However, the preferred way is for them to either become Accellera members or to become an individual technical contributor to the working group. Another audience member asked for Accellera to take the initiative and create a UVM users group that focuses on the experiences of the users, gathering the best and most promising activities and updates the standard when the time comes. Over the next five years UVM could go in many directions, or it could stand still and allow other standards to cover the ground that it was not designed to cover. One thing that is clear is that something is required in the near future, because many users are grappling with its deficiencies today and too many times we have heard that standards are too little, too late when they are finally implemented. At the same time, a rushed standard benefits nobody. The only clear solution is for more people to get involved in the creation of the new generation of verification standards because, whatever it looks like, we will have to put up with it for the next couple of decades. Experts at the Table. Part 2: Experts discuss reusability problems in verification and the steep learning curve facing new engineers. An action packed day at DAC where all extremes of the EDA problem space can be covered under one roof.